Pretoria is one of South Africa's three capital cities, serving as the executive (administrative) and de facto national capital. A beautiful city, Pretoria has numerous well-kept landmarks and is adorned with large parks and gardens, graceful government buildings, and wide avenues of purple flowering jacarandas. As the bastion of Afrikanerdom, it has also been known for its notorious supreme court and massive prison. In the mid-twentieth century racial segregation in the form of apartheid came into play in South Africa. The city had a rather sinister image as "the capital of Apartheid South Africa." However, its political reputation was changed with the inauguration of Nelson Mandela, as the country's first black President, at the Union Buildings there in May 1994. Since that time, many more well-educated and well-paid blacks work in the civil service and live in the capital, meaning Pretoria has become increasingly cosmopolitan. However, daunting problems remain, such as a 25.8 percent unemployment rate. Though advanced and modern, some of Pretoria's neighborhoods lack basic necessities, such as electricity and potable water. Government inability to deal with corruption adds to the problem of a region already bursting with illegal immigrants. 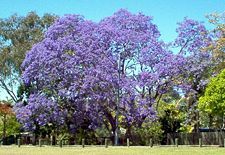 The jacaranda tree, from which Pretoria takes its nickname, "Jacaranda City". Pretoria is the transitional area between the Highveld, a high plateau area, and the Bushveld tropical savanna ecoregion, approximately 31 miles (50 km) north of Johannesburg in the northeast of South Africa. Pretoria stretches along both sides of the Apies River (also called the Tshwane River), in a warm, well-sheltered, fertile valley, surrounded by the hills of the Magaliesberg range, 4,495 feet (1,370 meters) above sea level. The city enjoys a dry, sunny climate, with the exception of occasional late afternoon downpours in the summer months of October to April. Temperatures are usually fairly mild due to the city's high altitude, with the average maximum daytime temperature in January of 70°F (21.5°C), dropping to an average maximum of around 52°F (11°C) in July. Snow is rare. Mean annual precipitation is 31 inches (784 mm). Pretoria is a well-planned city that covers 635 square miles (1,644 square kilometers). Many of the city's streets are lined with jacaranda trees that blossom purplish-blue in spring, giving rise to the city's nickname "Jacaranda City" (or "Jakarandastad" in Afrikaans). Pretoria's main street, Church Street, which stretches east-west for 12 miles (20km), is the longest urban street in South Africa and one of the longest straight streets in the world. The levels of smoke and sulphur dioxide have increased in the Pretoria metropolitan area, while lead levels have decreased. Industries, vehicles, veld fires, and the burning of coal by households without electricity causes the air pollution, which occasionally rises above acceptable standards during the winter. 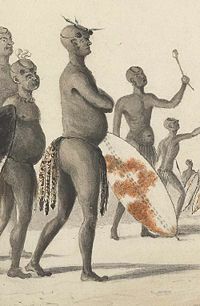 King Mzilikazi, as portrayed by Captain William Cornwallis Harris, circa 1836. Nguni-speaking refugees, who later became known as the Ndebele people, were probably the first people to recognize the suitability of the river valley which was to become the location of the future city of Pretoria for settlement. During the difaqane, a period of widespread tribal bloodshed between 1815 and about 1840, in KwaZulu-Natal Province, another band of refugees arrived in the area under the leadership of King Mzilikazi (1790-1868). However, they were forced to abandon their villages in their flight from Zulu raiders in 1832. Voortrekkers, who were mostly Trekboer (migrating farmers), reached the area in the 1830s. They were emigrants, mainly of Dutch ancestry, who left the Cape Colony (British at the time, but founded by the Dutch) moving into the interior of what is now South Africa, escaping drought and British control and seeking better land. The city of Pretoria was founded in 1855, by Marthinus Pretorius (1890-1901), a Voortrekker leader who named it after his father, Andries Pretorius. The elder Pretorius had become a national hero after his 470 Voortrekkers defeated 10,000 Zulus in the Battle of Blood River on December 16, 1838. Andries Pretorius also negotiated the Sand River Convention (1852), in which Britain acknowledged the independence of the Transvaal. This made him the first successful leader in the fight against British colonialism in Sub-Saharan Africa. Alluvial gold was discovered in 1853, in the Jukskei River north of Johannesburg by South African prospector Pieter Jacob Marais. Pretoria became the capital of the South African Republic on May 1, 1860. Australian prospector George Harrison discovered gold at Langlaagte in 1886. Diggers flooded into the area and discovered that there were richer gold reefs in the Witwatersrand. Tension with the British Empire burst into the First Boer War, which was fought from December 16, 1880, until March 23, 1881, between Boer guerrillas and British troops. The British garrison in Pretoria was besieged by Boer forces in December 1880 and March 1881. The peace treaty which ended the war was signed in Pretoria on March 23, 1881. The British agreed to Boer self-government in the Transvaal under a theoretical British oversight. The prospering nearby Johannesburg gold fields led to a series of incidents that culminated in the Second Boer War, fought from October 1899 to May 1902, between the British Empire and the two independent Boer republics of the Orange Free State and the South African Republic (Transvaal Republic). During the war, future British Prime Minister Winston Churchill (1874-1965) was imprisoned in the Staats Model School in Pretoria but escaped to Mozambique. The city surrendered to British forces under Frederick Sleigh Roberts, 1st Earl Roberts on June 5, 1900, and the conflict was ended in Pretoria with the signing of the Peace of Vereeniging on May 31, 1902. Paul Kruger (1825-1904), who was State President of the South African Republic (Transvaal), gained an international reputation as the face of Boer resistance against the British during that war, which resulted in the end of the South African Republic and start of British hegemony in South Africa. The Cullinan Diamond, the largest gem diamond ever found, was discovered in the town of Cullinan near Pretoria at the Premier Mine on January 26, 1905. The Boer Republics of the South African Republic and the Orange Free State were united with the Cape Colony and Natal Colony in 1910, to become the Union of South Africa. Pretoria became the administrative capital of the whole of South Africa, with Cape Town the legislative capital. Between 1860 and 1994, Pretoria was also the capital of the province of Transvaal, superseding Potchefstroom. On October 14, 1931, Pretoria achieved official city status. The National Party won the 1948 election on a segregation policy called “apartheid.” The new government banned opposition parties, and during the next 46 years, while it held power, introduced a series of laws, most notably the Group Areas Act of 1950, that specified where the races could live, work, or attend school. Pass laws were the main means of influx control. Pretoria's population had grown by the 1950s, and segregated, densely populated black townships, such as Atteridgeville and Mamelodi, were developed. When South Africa became a republic in 1961, Pretoria remained its administrative capital. Black discontent exploded in Soweto, Johannesburg, on June 16, 1976, when South African police fired on a group of students protesting against plans to impose Afrikaans as a language of instruction in black schools. An uprising spread to 80 South African cities. Townships exploded again in 1984, when the National Party introduced limited franchise to Indians and coloreds while excluding the black majority. Unrest continued through the 1980s, accompanied by strikes. The first multi-racial elections were contested in April 1994; the African National Congress won. Pretoria previously had a rather sinister image as "the capital of Apartheid South Africa." However, Pretoria's political reputation was changed with the inauguration of Nelson Mandela as the country's first black President at the Union Buildings in the same city in May 1994. As president, until June 1999, Mandela presided over the transition from minority rule and apartheid, winning international respect for his advocacy of national and international reconciliation. In 1994, Peter Holmes Maluleka was elected as transitional mayor of Pretoria, until the first all-race election held later that year, making him the first black mayor of the capital of South Africa. Maluleka later became the chairman of the Greater Pretoria Metropolitan City Council (later Tshwane Metro Council), then was elected Speaker of the Tshwane Metro Council. In 1999, South Africa held its second universal-suffrage elections. In 1997, Mandela had handed over leadership of the ANC to his deputy, Thabo Mbeki. Grietjie, one of the two cannons used during the Battle of Blood River. Paul Kruger, who gained international renown as the face of Boer resistance against the British during the Second Boer War. Photograph from 1879. The original architects of apartheid gathered around a map of a planned racially segragated township. The well-known terraced gardens of the Union Buildings, the president's residence. South Africa is a republic in which the president is both the chief of state and head of government, and is elected by the National Assembly for a five-year term. The bicameral Parliament consists of the National Assembly of 400 members, and the National Council of Provinces of 90 seats. Pretoria is one of South Africa's three capital cities, serving as the executive (administrative) and de facto national capital. Cape Town is the legislative capital and seat of the national parliament, as well as the provincial capital of the Western Cape. Bloemfontein is the judicial capital. In 2000, Pretoria became part of the City of Tshwane Metropolitan Municipality, which is contained in the province of Gauteng. The municipality is made up of thirteen former city and town councils and is managed by means of an executive mayoral system. 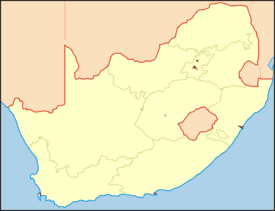 Gauteng province was formed from part of the old Transvaal province after South Africa's first all-race elections on April 27, 1994. On May 26, 2005, the South African Geographical Names Council approved changing the name of Pretoria to Tshwane, which is already the name of the Metropolitan Municipality in which Pretoria, and a number of surrounding towns are located. Should the change take place, "Pretoria" would continue to refer to the city's central business district. The proposed name change is controversial. Various public interest groups have warned that the name change will be challenged in court, should the minister approve the renaming. 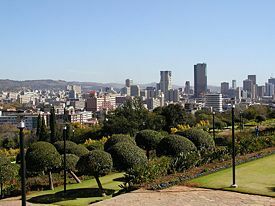 The Central Business District (CBD) of Pretoria, South Africa, is the traditional center of government and commerce, although today most corporate offices, small business, shops and many government departments can be found in the sprawling suburbs of the city rather than the CBD. Pretoria is also an important industrial center, with heavy industries including iron and steel casting, as well as automobile, railway and machinery manufacture, food processing, and diamond mining. Pretoria CBD, April 2006, from Lukasrand (Muckleneuk Hill), to the SE of the CBD. The city contributes 8.55 percent of the country's total GDP, making it the third biggest contributor behind Johannesburg and Cape Town, according to a 2002 study entitled, An Inquiry into Cities and Their Role in Subnational Economic Growth in South Africa. The median annual income of working adults aged 15-65 was US$3483 in 2007. The median annual income by race is US$2279 for blacks, US$4949 for coloreds, US$8440 for Indians/Asians, and US$10,867 for whites. About 25.8 percent of the population aged 15-65 is unemployed. Of the unemployed persons, 92.4 percent are black, 3.3 percent are colored, 0.8 percent are Indian/Asian, and 3.5 percent are white. About 32.2 percent of blacks are unemployed, 23.6 percent of coloreds, 8.1 percent of Indians/Asians, and 4.6 percent of whites. A Gautrain Rapid Rail Link, scheduled for completion in 2010, is an attempt to remedy transportation problems, by providing efficient high-speed rail between Pretoria, Sandton, Johannesburg, and OR Tambo International Airport. Geographical distribution of home languages in the Tshwane Metropolitan Municipality. The city had a population of 2,345,908 in 2007. According to the State of the Cities Report, the urban portion of Gauteng—comprised of Johannesburg, Ekurhuleni (the East Rand) and Tshwane (greater Pretoria)—will be an urban region with a projected population of some 14.6 million people by 2015, making it one of the largest cities in the world. The racial make-up of Gauteng province is Black 73.81 percent, White 19.90 percent, Colored 3.82 percent, and Indian/Asian 2.47 percent. In Gauteng province, 82.8 percent of households have a flush or chemical toilet, 84.2 percent have refuse removed by the municipality at least once a week and 2.6 percent have no rubbish disposal, 47.2 percent have running water inside their dwelling, 83.6 percent have running water on their property, 73.2 percent of households use electricity for cooking, and 62.1 percent have a refrigerator. In the province, 14.4 percent of residents speak Afrikaans at home, 12.5 percent speak English, 1.9 percent speak IsiNdebele, 7.6 percent speak IsiXhosa, 21.5 percent speak IsiZulu, 10.7 percent speak Sepedi, 13.1 percent speak Sesotho, 8.4 percent speak Setswana, 1.4 percent speak SiSwati, 1.7 percent speak Tshivenda, and 5.7 percent speak Xitsonga. 1.0 percent of the population speaks a non-official language at home. About 76 percent of residents are Christian, 18.4 percent have no religion, 1.7 percent are Muslim, 0.5 percent are Jewish, 0.8 percent are Hindu, while 2.6 percent have other or undetermined beliefs. Pretoria is one of South Africa's leading academic cities, and is home to the largest residential university in the country, the University of Pretoria, the Tshwane University of Technology, and the largest distance education university (the University of South Africa, more commonly known by its initials, UNISA). The South African Council for Scientific and Industrial Research (CSIR) is located in the city. In Gauteng, 8.4 percent of residents aged 20 and over have received no schooling, 11.2 percent have had some primary school, 5.5 percent have completed only primary school, 34.3 percent have had some high school education, 28 percent have finished only high school, and 12.6 percent have an education higher than the high school level. Overall, 40.6 percent of residents have completed high school. The Voortrekker Monument, which is is a massive granite structure, built to honor the Voortrekkers who left the Cape Colony in the thousands between 1835 and 1854. 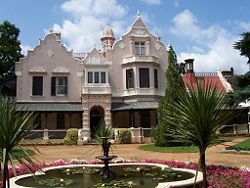 Kruger House, which is the historical residence of the Boer leader and President of the South African Republic, Paul Kruger, was built in 1884. Milk was used, instead of water, for mixing the cement from which the house was constructed, as the cement available was of poor quality. Melrose House, which is a stately Victorian mansion built in 1886, was used as the headquarters for the British forces during the Second Boer War, and was where the Treaty of Vereeniging which ended the war, was signed in 1902. Marabastad, which is a business area near the city center of Pretoria, was a culturally diverse community, with the Hindu Mariamman Temple its most prominent landmark. Marabastad inhabitants were relocated to single-race townships further away from the city center. Unlike other townships, it was not bulldozed, but it retained many of its original buildings, and became primarily a business district. The National Zoological Gardens of South Africa, which is the national zoo of the nation, was established at the outbreak of the Second Boer War in 1899. There are nature reserves at Groenkloof, Rietfontein, Moreletaspruit, Faerie Glen, and Wonderboom. The Transvaal Museum, which is a natural history museum founded in 1892, has large collections of Plio-Pleistocene fossils, (including hominids from Sterkfontein, Swartkrans and Kromdraai in the Cradle of Humankind), as well as late Permian therapsids, mammal-like reptiles from the Karoo. One of the most popular sports in Pretoria is rugby union. Loftus Versfeld is home to the Blue Bulls who compete in the domestic Currie Cup, the Bulls who won the international Super 14 competition in 2007, and to soccer side Mamelodi Sundowns. Pretoria hosted matches during the 1995 Rugby World Cup. Loftus Versfeld will be used for matches of the 2010 Soccer World Cup. The Sundowns and Supersport United compete in the Premier Soccer League. Cricket is also popular. The a post-grunge band Seether is from Pretoria. 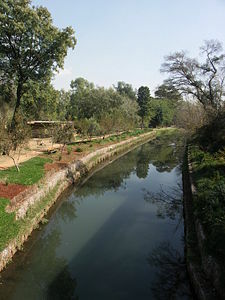 The Apies River as it flows through the National Zoological Gardens of South Africa in Pretoria. Pretoria is a beautiful city with numerous well-kept landmarks. 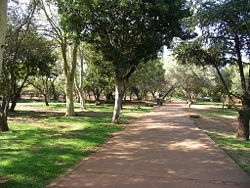 It is adorned with large parks and gardens, such as the well-known terraced gardens of the Union Buildings and the sunken gardens of Venning Park. Near the city is the National Zoological Gardens of South Africa, which has been successful in breeding several endangered species and was the first zoo to breed the aardwolf, a member of the hyena family. It is one of South Africa's leading academic cities, yet over eight percent of its residents over the age of 20 have never received formal education. Although more well-educated and well-paid blacks have been working and living in Pretoria since black majority rule began in 1994, daunting problems remain. Though advanced and modern, some of Pretoria's neighborhoods lack basic necessities such as running water, modern toilets, regular rubbish removal and electricity. As is common in much of South Africa, these problems occur for the most part in the black neighborhoods. While it is primarily a seat of government, it is also an important rail and industrial center. The unemployment rate is lower than nearby Johannesburg, but about 25.8 percent of the working-age population is unemployed, of which 92.4 percent are black. And while Pretoria does not have the same high crime rate as Johannesburg, tourists are routinely warned to be careful. In addition, government inability to deal with corruption adds to the problem of a region already bursting with illegal immigrants. It is projected that the urban portion of Gauteng Province, comprised of Johannesburg, Ekurhuleni (the East Rand) and greater Pretoria will merge by 2015 and contain some 14.6 million people, becoming one of the largest cities in the world. Its high unemployment rate and uneven distribution of education and necessities are issues that must be resolved in order to handle additional growth. The city has a firm foundation but needs a vision that includes the eradication of poverty and lack. ↑ W.A. Naudé and W.F. Krugell, An Inquiry into Cities and Their Role in Subnational Economic Growth in South Africa (Helsinki: United nations university, World institute for development economics research, 2004, ISBN 9789291905850). Encyclopaedia Britannica. 2008. Pretoria. Retrieved August 18, 2008. Jenkin, Tim. 1987. Escape from Pretoria. London: Kliptown Books. ISBN 9780904759785. Lodge, Tom. 2005. "Pretoria." Encyclopedia of African History. 1229-1230. Thompson, Leonard. A History of South Africa, 3rd edition. Yale University Press, 2001. ISBN 0300087764. World Fact Book. 2008. South Africa. Retrieved August 18, 2008. This page was last modified on 11 October 2016, at 18:51.